But to what extent will these updated labels tell consumers whether the food is “good” for their families? The answer depends on what consumers subjectively believe is important to know about the food that they are purchasing, and whether those facts are listed on the labels. In response to this proposed rule, consumer advocate groups have been quick to point out that the proposal fails to address labeling requirements pertaining to a subject of great interest: genetically modified organisms (GMOs). Proponents of GMO labeling say that foods that contain GMOs are not “good” for people and their families. GMOs are produced when a favorable trait from one organism is transferred to another organism: a segment of DNA is taken from the favorable organism and “is extracted and spliced into a recipient organism’s preexisting DNA.” The effects of tempering with the recipient organism’s DNA are a concern because of the current food and agricultural industry assumption that “if a gene was safe in one plant, it ‘will be safe when transferred’ via biotechnology ‘to another plant.’” However, unexpected toxins and allergens can be created when genes are spliced and transferred. Unseen gene mutations may result, or plants may be created “in which the levels or bioavailability of important nutrients are altered in significant ways that could be harmful to human health.” And there is the possibility that bioengineering of food and plant organisms could inadvertently create a super-virus, which could cause disease among humans and have the potential to be widespread and fatal to human life. The court in Alliance deferred to the FDA in its holding. In general, provided Congress has not spoken directly to the issue via statutory language, courts generally defer to agencies and allow them a great deal of discretion in their statutory interpretations. Courts are particularly unlikely to strike down an agency’s interpretation if it pertains to the agency’s own enabling statute. The caveat is that the agency’s interpretation must be “based on a permissible construction of the statute” and cannot be arbitrary and capricious. In Alliance, the court held that the agency’s interpretation of the statute was reasonable and was therefore not arbitrary and capricious. Since Congress did not provide a clear definition of the term “material,” the agency was within its means to interpret it in such a way that focused on safety concerns while excluding consumer interests. In addition, the court held that GMOs do not materially alter foods. Thus, “the FDA lacks a basis upon which it can legally mandate labeling, regardless of the level of consumer demand,” given the FDA’s interpretation of the term “material.” So, if the FDA were to change its definition of “material,” it might have jurisdiction to mandate the labeling of GMOs. Since the FDA’s refusal to require GMO labeling is within its powers, the next question focuses on what can be done to encourage, if not mandate, the labeling of GMO products. Since courts are likely to uphold Alliance and defer to the FDA with respect to statutory interpretation, one solution is to go through Congress. If Congress clarifies the term “material” so as to include consumer interest, the FDA will have to mandate GMO labeling. In addition, on the state level, citizens and consumer groups could push for GMO labeling. In fact, several states have already considered either legislation or ballot initiatives to accomplish this goal. In addition, due to the voluntary nature of GMO labeling, consumers could encourage the labeling of GMOs by boycotting manufacturers who are known to use GMOs, but who fail to label the products accordingly. Yet the initiative to label GMO products is not without its critics. Some have stated that it is unclear how much consumer interest is coming from individual consumers as opposed to consumer groups. So even if the FDA were to interpret the term “material” to include consumer interest, it is unknown how many people would actually appreciate and utilize the change in label. In addition, there are concerns with giving consumers an unrestricted “right to know” what is in their food products, as conveyed by labels. First, requiring the labeling of GMOs because consumers have a right to know would be a fundamental shift in nutritional labeling. Rather than being governed by significant health effects, nutritional labeling would also be governed by what people want to know. And what people want to know could be something that might pose a health risk, or it could be something that provides a health benefit. Second, labels can only hold so much information to be reasonably beneficial to consumers. If nutrition labels contained every little product for which consumers demanded a right to know, the labels would be filled with too much information. Consumers will not want to spend unreasonable amounts of time looking through the fine print on a label to find the ingredient (or ingredient which makes up the ingredient) with which they are concerned. And the value of having a label will be diluted, as too much information could lead people to simply ignore the labels altogether. Moreover, despite current labeling rules, due to FDA requirements, consumers do not actually know every single thing that goes into their food products. Nor would they likely want to know if some of the ingredients are repulsive. Under the current rules, although the FDA approves food products as unadulterated, they may contain trace amounts of “poisons, pesticide residues, additives, filth, or decomposed manner… as long as the levels are below those set by the FDA.” So even if the FDA were to require GMO labeling, it is possible that products that actually contain GMOs would not have to be labeled to reflect the presence of GMOs if they do not meet the threshold amount of GMO ingredients. At this time, although consumers and consumer groups may not be too enthusiastic that the proposed Nutrition Facts label does not include information about GMOs, there are ways to change the food labeling policy. As bioengineering in the food industry becomes more prevalent, and studies on the effects of GMOs are done, consumers may be more insistent on transparency from manufacturers. But until Congress enacts legislation that would require such labeling, it is very unlikely that the FDA will change its stance and mandate the labeling of GMOs. -Dayna Chikamoto is a General Member on MJEAL. She can be reached at dchikam@umich.edu. Food Labeling: Revision of the Nutrition and Supplement Facts Labels, 79 Fed. Reg. 11879 (proposed Mar. 3, 2014). Press Release, Office of the First Lady, The White House and FDA Announce Proposed Updates to Nutrition Facts Label (Feb. 27, 2014), http://www.whitehouse.gov/the-press-office/2014/02/27/white-house-and-fda-announce-proposed-updates-nutrition-facts-label. Ronnie Cummins, New FDA Food Label Rules Ignore the GMO Elephant in the Room, Huffington Post, http://www.huffingtonpost.com/ronnie-cummins/new-fda-food-label-rules-_b_5022900.html (last visited Apr. 8, 2014). David Alan Nauheima, Food Labeling and the Consumer’s Right to Know: Give the People What They Want, 4 Liberty U. L. Rev. 97, 102 (2009) (discussing the creation of genetically modified organisms). Alliance for Bio-Integrity v. Shalala, 116 F. Supp. 2d 166 (D.D.C. 2000). Chevron, U.S.A., Inc. v. Natural Res. Def. Council, Inc., 467 U.S. 837, 843 (1984). 116 F. Supp. 2d. at 179. Frank J. Miskiela, Voluntary Labeling of Bioengineered Food: Cognitive Dissonance in the Law, Science, and Public Policy, 38 Cal. W. L. Rev. 223, 240 (2001) (discussing consumer demand for labeling). Prev What are the “waters of the United States”? 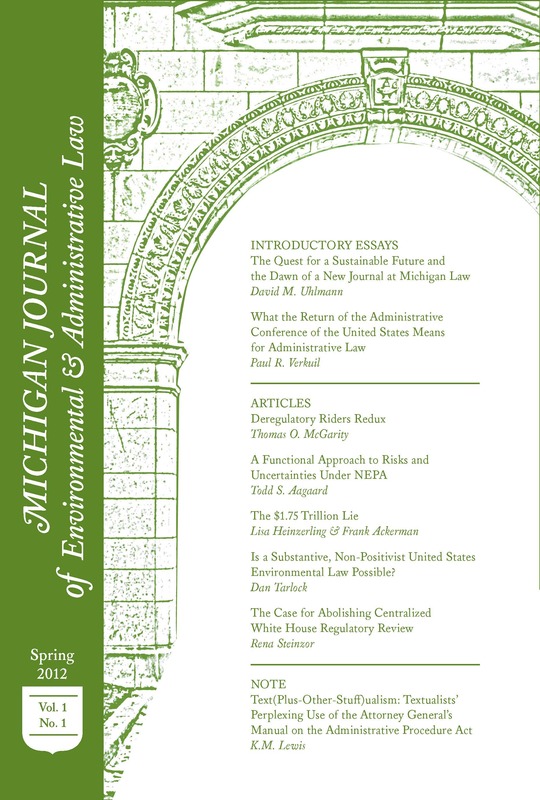 Re-defining or clarifying EPA’s jurisdiction under the Clean Water Act?